Notice the coverings on Adam and Eve. The cartoonist seemed to know a little about the shape of a fig leaf. 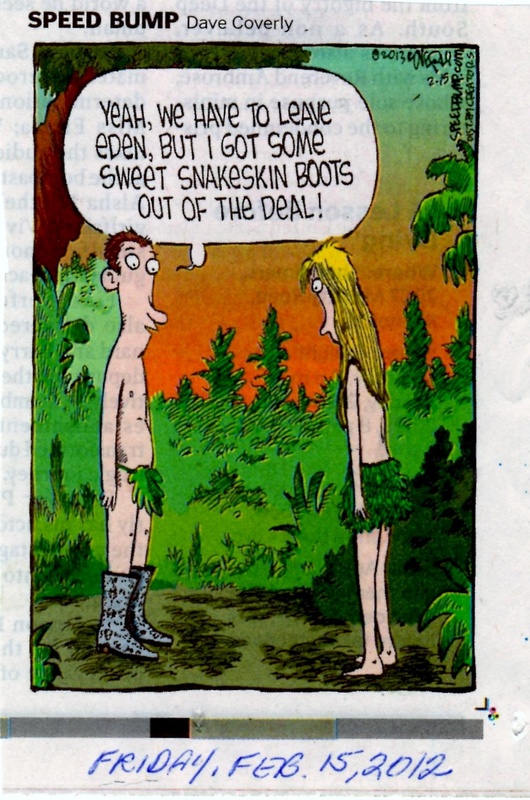 In the real story, Adam didn’t even get snake-skin boots out of his disobedience. I wonder what challenges — even problems — that occurred in my life as the result of disobeying God? This entry was posted in Uncategorized and tagged Adam and Eve, Bible Plants, Bible Study, Fig leaf, Garden of Eden, God as a Gardener. Bookmark the permalink.